On August 11, 2009, the Yemeni government launched "Operation Scorched Earth," aimed at putting an end to the Huthi uprising that had destabilized the country's northern province of Sa'da for more than five years. As fighting spread to the province's border with Saudi Arabia, Huthi fighters attacked a Saudi border post in early November, killing one guard and injuring eleven. The Saudi government immediately declared that the rebels had crossed a red line and began bombing Huthi positions along the border. Yet what was apparently conceived as a quick operation to clear the region of "infiltrators" turned into a major operation involving ground troops and air power, which lasted slightly over three months and exacted more than a hundred Saudi casualties. Abd al-Malik, pictured, has taken up the mantle of the rebellion's leadership. He is the brother of the movement's founder, Hussein al-Huthi, and son of Badr ad-Din al-Huthi, an elderly and highly influential Zaidi scholar considered to be the principal religious authority for the rebel group. While the Yemeni government emphasized two major aspects of the conflict—the Huthis' desire to reinstate the imamate that was overthrown in 1962, and their being an Iranian proxy that had no popular legitimacy—the most recent round of fighting leading up to the Saudi intervention was in fact driven by local concerns: the fight between the Huthis and the Yemeni government for control over the main roads in Sa'da and Riyadh's long-standing concern to secure its border with Yemen. Given Riyadh's worries about its own potentially restive Shiite population, on the one hand, and San'a's inability to curb the influence of the Huthis' Zaidi revivalism, on the other, the Saudi government will probably continue to amplify Tehran's supposed involvement in the region as it has done on various occasions since 1979. Still, the Huthis' subservience to Tehran has never been fully substantiated. The rebels have been fighting the Yemeni government since 2004 and are followers of Hussein al-Huthi, a sayyid (descendant of the Prophet Muhammad through his grandchildren Hussein and Hassan), who headed a network of education centers initially called the Believing Youth Club (BYC, al-Shabab al-Mumin). Founded in 1991 by a group of activists that included Hussein's brother Muhammad, the BYC aimed at providing education to the youth of Sa'da while reviving the influence of Zaidia, a Shiite branch endemic to Yemen, which had been in decline since the overthrow of the imamate. The group quickly expanded, opening centers throughout Sa'da province and the adjacent provinces of al-Jawf and Amran. By the middle of the decade, ideological differences and rapid growth led to an internal split within the group. The branch that took control of most centers fell under the influence of Hussein al-Huthi, who acquired a loyal following among group members. Elected to represent his home district of Haydan (Sa'da province) in parliament in 1993, Huthi quit politics four years later and went to Sudan to pursue a degree in Qur'anic studies. 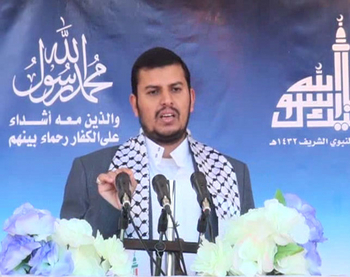 After returning to Yemen, he became more involved in the BYC and led the group in an increasingly political direction. His sermons, which became the basis of the group's ideological and political platform, focused among other things on the weakness of the Arab nation and the need to confront Israel, the United States, and their regional "clients," an indirect indictment of the Yemeni government. The Yemeni authorities were accustomed to overseeing and monitoring the activities of nongovernmental groups, and the BYC was no exception. Only in the early 2000s, though, did they begin expressing serious concern with some BYC activities, particularly after the group adopted as its slogan "Allahu Akbar! Death to America! Death to Israel! Curse the Jews! Victory to Islam!" Unwilling to capitulate to government demands to stop using the slogan and otherwise cease defying the state, Huthi was declared persona non grata. When in June 2004 a large group of followers chanted the slogan outside the Great Mosque in San'a, security forces were sent to detain him at his mountain stronghold thus triggering the "Huthi uprising." The first round of fighting (June-September 2004) took place mostly around the Marran Mountains (in the western part of Sa'da province) where Huthi and a group of his followers evaded government forces for months and ended when Huthi was killed in September 2004. A second round of fighting broke out the following spring (March-April 2005), this time spearheaded by Hussein's father Badr ad-Din al-Huthi, an elderly and highly influential Zaidi scholar considered the principal religious authority for the BYC. While the first round of fighting was specifically aimed at detaining or killing Huthi, the second focused on decapitating the movement by going after its various leaders. A short, third round of fighting took place at the end of the same year, expanding to new parts of Sa'da. This time the rebels were under the leadership of Badr al-Din's young son Abd al-Malik, who based himself in the remote northwest fringes of the province. Fighting escalated significantly in the fourth round (February 2007-January 2008). Much of Sa'da province became engulfed in violence, with previously unengaged groups drawn into the hostilities. The conflict expanded into neighboring provinces, most notably Harf Sufian in Amran province (an early BYC stronghold), strategically located along the San'a-Sa'da highway and along a major tribal fault line. The Huthis were able to seize and hold various government installations and military bases, allowing them to procure advanced weaponry and take the fight beyond their traditional strongholds. The nearly yearlong fighting ended only through Qatari mediation. Soon thereafter, though, the government and the Huthis engaged in mutual recriminations, resulting in a short fifth round of fighting (May-July 2008). For the first time, fighting broke out in an area near the capital San'a. Much of the violence was by now unrelated to the initial conflict of 2004 and instead involved people seeking revenge for the bloodshed of previous fighting, as well as tribes seizing the opportunity to settle long-standing disputes and to benefit materially from the fighting. Hostilities ended in the summer of 2008 when the government unexpectedly claimed a decisive victory and declared a unilateral ceasefire. The government's decision to stop fighting was variously attributed to concerns that the situation could spiral out of control, domestic mediation efforts, or U.S. and EU concerns with the humanitarian situation. Hussein al-Ahmar, a government critic with little sympathy for the Huthis, called the decision to end the fighting before the rebellion had been destroyed "a betrayal of the nation." Located in Yemen's northwest corner, mountainous Sa'da province was Yemen's political capital until the seventeenth century. (See Map 1.) As the heartland of Zaidism—which provided the ideological underpinnings for Yemen's imamate—the province has generally maintained a cautious relationship with the republican government that overthrew the imamate in 1962. The area is among Yemen's poorest and least developed with limited public services and infrastructure. These factors, along with Huthi's charisma, perceived integrity, and rhetorical power, allowed the BYC to incorporate marginalized, disaffected youth and tribal leaders from various parts of the province into the Huthi movement. The Huthis established a loyal following in Huthi's native Marran, as well as in Dahyan (the center of Zaidi scholarship northwest of Sa'da city), Harf Sufian in Amran province, parts of Sa'da city, and various other locations. Map 1: Border area between Sa'da province, Yemen, and Saudi Arabia. While it may be reasonable to treat Sa'da province as a coherent unit due to its historical, geographical, and cultural particularities, the province exhibits a great deal of internal diversity. It can be divided into three main regions: the tall mountains and adjacent foothills in the west, the arid mountains and highlands in the center, and the desert to the east. While the sparsely populated eastern desert is mostly inhabited by tribes belonging to the Bakil, one of Yemen's two main tribal confederations, the western mountains are the main population center for the tribes of Khawlan bin Amr, Yemen's third and least politically influential tribal confederation. Some tribes of the Hashid confederation, whose members have largely dominated Yemen's post-imamate government, live in the Sa'da highlands alongside Bakil and Khawlan tribes although Hashid's prominence is greater in areas south of Sa'da. Smuggling has flourished along the western border of Sa'da province due to various factors including the socioeconomic disparities between Saudi Arabia and Yemen, the difficult terrain, minimal government presence, and the limited incorporation of the local population into the national fabric. The crossings along the west of Sa'da province's border into the Saudi province of Jazan are all informal, allowing for shared grazing rights along pastoral areas and low-level commerce. Human trafficking of refugees, workers, and women and children forced into labor, principally from Yemen and Somalia, is widespread in this area as is the smuggling of weapons and qat (a mild stimulant widely cultivated and consumed in Yemen but forbidden in Saudi Arabia). Various food products, including sheep, milk, and produce, also cross from Yemen into Saudi Arabia. Flowing in the other direction are imported generic medicines, various industrial and manufactured goods, and cash. With one of their main strongholds, Marran, located in the center of the province's western mountains, the Huthis were able to build alliances with smugglers in the region who likewise resented government interference. Years of fighting and constant roadblocks along the few routes connecting the region to the provincial capital increased the prevalence of smuggling. While heavy fighting along the border areas did not break out until the sixth round in 2009, intermittent clashes between the Yemeni army and smugglers were common, and many smugglers sided with the Huthis for practical rather than ideological reasons. The vast and largely uncontrolled border between Saudi Arabia and Yemen has for some time been a source of tension between the two countries. In 1934, they agreed to a general demarcation line by signing the Taif agreement. Although a survey was begun some years later, the agreement, which was to be periodically renewed, was left dormant for many years. Uncertainty over its status—first with the overthrow of the Saudi-backed imamate in 1962 and subsequently with Yemeni unification in 1990—came to the fore when a border dispute led to armed clashes in the early 1990s. This was resolved in a 1995 memorandum of understanding that renewed the terms of the Taif agreement. In 2000, the two countries signed the Jeddah treaty, which, in theory, demarcated the border definitively. Among other things, the treaty called for the creation of a demilitarized zone, with only mobile border guard stations allowed ten kilometers from the border on each side, while also providing for shared grazing and fishing areas. As early as 2003, during the early stages of the Huthi conflict, Riyadh had begun building a barrier fence to mark the border clearly and prevent illegal crossings, mainly along the vast stretches of desert east of Sa'da province. The building of the barrier elicited strong opposition from both those tribes whose territories it cut across and from the San'a government, which claimed that it violated the free movement along the border stipulated in the 2000 Jeddah treaty. In 2004, it convinced the kingdom to halt construction with the two sides agreeing to increased coordination along the border. With violence in Yemen increasing and many Saudi members of al-Qaeda having fled to Yemen, in the summer of 2009, Riyadh began extending a high-tech razor wire fence it had just built along its northern border with Iraq to all its borders, including the region on the western mountains of Sa'da. Riyadh's prioritization of border security together with San'a's inability to control areas immediately across the border in Sa'da were in large part responsible for the Saudi willingness to directly intervene to control its borders. In the fall of 2008, shortly after the Yemeni government declared an end to the fifth round of fighting, returning Huthis killed a member of the powerful Walid Amr tribe in Ghamr district. As the tribe sought retribution, tensions began building between the two factions. In February 2009, Huthi supporters attempted to take over various government installations in the district after accusing the government of supporting the Walid Amr tribe in their dispute. Around the same time, clashes were also taking place in other districts which had been key flashpoints in previous rounds of fighting (Marran since 2004 and Harf Sufyan since 2007). Ghamr district, located along a road linking the western highlands and border towns to the Sa'da basin, had until then been relatively calm. Huthi fighters soon took control of a mountain overlooking the district capital and about a month later had seized control of various government centers in the district. They proceeded to set up blockades along the road to Sa'da city in an attempt to isolate Ali Zafir, sheikh of the Walid Amr tribe, and his fighters, as well as government troops. When reinforcements arrived in neighboring Razih district, the Huthis began attacking government positions there as well. The spark that began in Ghamr soon spread to neighboring districts and then down the foothills along the border with Saudi Arabia. While the villages along the western mountains are connected by various dirt roads and wadis (dry riverbeds), routes permitting military transport are limited and thus control of the few paved roads is crucial for any government campaign. 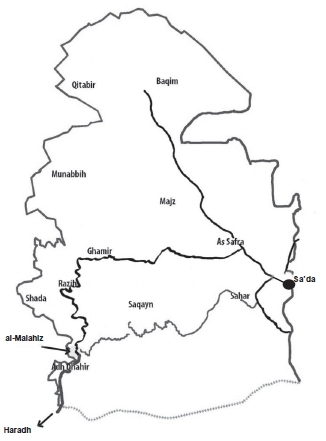 Two intermittently paved roads connect Sa'da city to this area, one through the Marran Mountains (an important bastion of Huthi support) and the other cutting through Ghamr and Razih (see Map 2). Both roads eventually connect to the border town of al-Malahiz, home to an important Yemeni military base. Map 2: Paved roads to Sa'da city. As fighting flared in Ghamr district, both sides attempted to isolate the other by setting up roadblocks and checkpoints along the Sa'da-Razih road, which made reaching the area from the provincial capital nearly impossible. In response, the government sent reinforcements along the Harad-Malahiz road and then up the mountains through Razih. With much of the western mountains cut off from the provincial capital, both the Huthis and area residents relied increasingly on smuggled goods from Saudi Arabia—flour and gasoline were most in demand— making the situation along the border all the more volatile when government troops moved in. By the end of July 2009, the fighting that began in Ghamr had spread to Razih and then down the mountains into Shada district. The Huthis had effectively isolated government troops and their tribal allies in Ghamr and were close to doing so in Razih. On August 4, one week before the government officially launched its campaign, the Huthis overran the 82nd Infantry Brigade's base in Shada district and seized large amounts of ammunition, mortars, rockets, tanks, and armored vehicles. Although fighting had already been going on for some months, this event was the catalyst for the launching of "Operation Scorched Earth." Units from Yemen's 15th Infantry Brigade were mobilized to regain Shada district, but one week later, on August 19, the Huthis announced the fall of the military base at Malahiz, forcing government troops to retreat west into Saudi Arabia. It was inevitable that areas across the border would be affected by the heavy fighting, and as early as August, the Huthis had accused the Saudi military of firing on them and bombing their positions. In October, stray rockets fired by Yemeni troops had exploded within Saudi territory. With Yemeni forces unable to fully control Malahiz and surrounding villages, Saudi intervention—regardless of the provocation—was only a matter of time. According to the Huthi narrative, on November 1, a Saudi border patrol allowed Yemeni troops to attack rebel positions from Jabal Dukhan, a mountain on the Saudi side of the border, which provides an important vantage point over the towns of Manzalah and Malahiz. On November 3, Huthi fighters opened fire on Saudi border guards stationed on the mountain, killing one and injuring nearly a dozen. Saudi troops returned fire, to which the rebels responded by overrunning the strategic area and seizing control of both sides of the mountain. Saudi bombing began the next day, with the Huthis claiming that Malahiz, Hussamah, lower Marran and various border villages had been hit. The Saudi government maintained that it was only bombing Huthi-held positions within its own territory. After three months of heavy fighting, in February 2010, the Huthis agreed to abide by six ceasefire conditions laid out by the Yemeni government, allegedly to spare the people of Sa'da from further death and destruction. The Saudi government declared its intervention a success, stating that its territory was now clear of "infiltrators." Yet despite its vast military superiority, Riyadh was only able to declare victory after months of fighting, significant combat casualties, and a mutual ceasefire. The Yemeni government, in turn, was unable to impose its control over the province, perhaps in part due to its focus on maintaining regime stability and cohesion while at the same time dealing with the threat of a growing southern secessionist movement. Lacking Saudi intervention, the outcome for the Yemeni government would likely have been even less favorable. The sixth round of fighting saw the Huthis employ three main tactics: targeting prominent government figures or allies, preventing government forces from accessing areas of fighting, and attacking and occasionally overrunning military bases and checkpoints. By taking over military installations, the Huthis have been able to seize weapons of increasing sophistication, including NATO-class machine guns, mortars, and sniper rifles, as well as communications gear, armored personnel carriers, and other vehicles. The February 2010 truce seemed on the verge of collapse the following summer after fighting between Huthi loyalists and government-backed tribes resumed. After the Huthis overran a military base and captured hundreds of soldiers in July, a seventh round of fighting seemed imminent. The captives, however, were released a few days later, and Qatari mediation helped the two sides reach a more substantive agreement in August. Despite lingering mistrust, a series of confidence-building measures followed in the second half of 2010, including the release of detainees and a Huthi hand-over of seized military equipment. A further layer of complexity was added to the situation in November-December 2010 when al-Qaeda in the Arabian Peninsula, whose activities had been largely confined to other parts of Yemen, carried out two deadly suicide bombings against Huthi followers and subsequently declared war on the country's Shiites. The first bombing occurred during Id al-Ghadir, a Shiite celebration revived by the Huthis, which had in the past been a source of contention between them and Salafists in the area. Toward the end of January 2011, inspired by the success of the popular uprisings in Tunisia and Egypt, young antigovernment protesters took to the streets of San'a calling for a change of regime. Demonstrations quickly grew and spread to Yemen's main urban centers. Shortly thereafter, the Huthis announced their full support for the protest movement and helped organize peaceful marches in various parts of Sa'da province. On March 4, at one such demonstration held in Harf Sufian, two protesters died from gunshots alleged to have originated from a nearby military base. Shortly before the popular protests overwhelmed the government, northern Sa'da appeared headed toward a new round of fighting. Echoing the events that catalyzed the summer 2009 fighting, Huthi followers clashed in January 2011 with members of a government-backed tribe on the southwestern fringes of Sa'da city, an area that had largely remained under government control during the many years of fighting. With the regime's resources increasingly diverted toward maintaining control over the capital, the Huthis eventually prevailed and in late March took control of the provincial capital. With the Huthis in de facto control of most of Sa'da province, a struggle broke out in the neighboring province of al-Jawf, a dry and sparsely inhabited area east of Sa'da that had also fallen out of government hands in March. Paradoxically, the latter clashes pitted the Huthis against the Sunni opposition Islah party—perhaps the strongest and best-organized among the groups calling for the resignation of President Ali Abdullah Saleh, which will likely play a prominent role in a post-Saleh state. As a Sunni-oriented group, it is a natural repository for Saudi influence-buying. Fighting in al-Jawf, apparently for control of the government's military installations, intensified in July 2011, sparking fears that it could spill over into Saudi Arabia. After a number of failed attempts, a truce was reached in mid-August 2011. A few days later, a suicide bomber, apparently targeting the Huthis, struck a provincial medical center. Sa'da province, meanwhile, appears to be fairly stable. The new provincial governor, Fares Man'a, allegedly appointed by the Huthis, is a notorious international arms dealer and former mediator in the Sa'da conflict, who fell out with the Saleh government after being accused of helping arm the Huthis in 2009. By some accounts, Sa'da became safer than the capital in the early summer of 2011 as many refugees from the Huthi conflict returned home from San'a. Events in al-Jawf, however, indicate that fighting could resume in the area. Saudi policy is unlikely to accommodate a stable and largely autonomous section of northern Yemen under Huthi control. Unlike the short-term elements that drew the Saudi military into Sa'da province in late 2009, the fear in this case is that Iran will, in the medium term, successfully establish a foothold in the region. On the heels of events in Bahrain and the region as a whole, Riyadh is operating under a heightened level of threat perception. A protracted power vacuum in Yemen will pave the way for increased foreign meddling. The Gulf Cooperation Council (GCC) and the Saudis in particular will do whatever they can to avoid a collapsed or fragmented Yemeni state. One of their main policy tools in this regard consists of buying the favor of various tribal and Sunni groups that have clashed with the Huthis over the years. Thus the potential for a proxy war in northern Yemen will persist the longer the country's political impasse remains, making it more difficult for the state to reconstitute itself before it is too late. Lucas Winter is a researcher at the Foreign Military Studies Office at Fort Leavenworth, U.S. Army. The views expressed here are those of the author. The Guardian (London), Nov. 23, 2009. While Saudi and Yemeni charges of Tehran's material support for the Huthis have never been proven, there is little doubt of Iran's political support for the Huthis. Tehran's condemnation of Saudi policy in Yemen via its Arabic-language news network al-Alam earned the channel a temporary suspension from the Saudi-owned satellite ArabSat, purportedly for contractual reasons. See, Asharq al-Awsat (London), Nov. 5, 2009. Al-Eshteraki (San'a), Sept. 7, 2007. Abdullah Lux, "Yemen's Last Zaydi Imam: The Shabab al-Mu'min, the Malazim, and hizb Allah in the Thought of Husayn Badr al-Din al-Huthi," Contemporary Arab Affairs, Sept. 2009. Mareb Press (San'a), Feb. 27, 2007. Katherine Zimmerman and Chris Harnisch, "Profile: al-Houthi Movement," Critical Threats, American Enterprise Institute, Washington, D.C., Jan. 28, 2010. Barak A. Salmoni, Bryce Loidolt, and Madeleine Wells, Regime and Periphery in Northern Yemen: The Huthi Phenomenon (Santa Monica: The RAND Corp., 2010), p. 136. Zimmerman and Harnisch, "Profile: al-Houthi Movement." Al-Jazeera English (Doha), Feb. 1, 2008. "Yemen: Defusing the Saada Time Bomb," Crisis Group Middle East Report, no. 86, May 27, 2009, p. 4. Yemen Times (San'a), Sept. 6, 2007. Treaty of Taif, May 20, 1934. Treaty of Jeddah, June 12, 2000. Islam Daily (Sindh Punjab Sarhad), Mar. 3, 2007. In August 2009, a suicide bomber, posing as a repentant jihadist, nearly killed Saudi deputy interior minister Prince Muhammad bin Nayif in Jeddah. The planning of the attack was traced to Yemen. Asharq al-Awsat (London), Nov. 10, 2009. Much of the information provided below was taken from the Huthi website Sadahonline. As of March 2011, the website has been taken offline. See, also, Yemen Times, Mar. 1, 2009. Middle East Online (London), Oct. 19, 2009. The New York Times, Feb. 11, 2010. On Huthi tactics and weapons, see Salmoni, et al, Regime and Periphery in Northern Yemen, pp. 197-215. Yemen Times, Dec. 6, 2010. Shelagh Weir, "A Clash of Fundamentalisms: Wahhabism in Yemen," Middle East Report, 204 (1997): 22-6. News Yemen (San'a), Feb. 16, 2011. "Yemen: Investigate Killing of Protesters," Human Rights Watch, Washington, D.C., Mar. 10, 2011. National Yemen (San'a), Mar. 30, 2011. Yemen Post (San'a), Aug. 16, 2011. Yemen Times, May 3, 2011. Related Topics: Persian Gulf & Yemen, Saudi Arabia | Winter 2012 MEQ receive the latest by email: subscribe to the free mef mailing list This text may be reposted or forwarded so long as it is presented as an integral whole with complete and accurate information provided about its author, date, place of publication, and original URL.